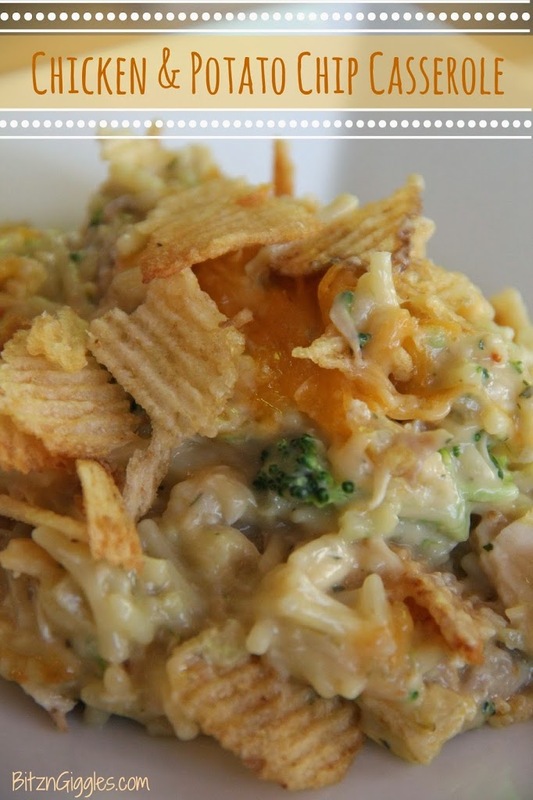 Chicken and Potato Chip Casserole – chicken, rice and broccoli covered in melted cheese and crisp potato chips! I know what you’re thinking? Another recipe for comfort food? It’s spring for goodness sakes. You’re right, somewhere it is spring. But here in Wisconsin, it’s not. We just had another winter storm last Friday! I will admit, the snow is slowly melting and it seems as if we may warm up a bit more this week, but I won’t believe it until I see it AND feel it. I seriously have about 30 minutes to prepare a meal in the evening. Are your evenings like this, too? I often wonder how other families do it? I am moving nonstop from the time I get home from work until about 8:00 pm or so. The next day I wake up at 5:00 am – the kids at 6:00 am and we do it all over again. There are some mornings I actually prep for dinner, getting out my seasonings, etc. in the morning and set things out on the counter so everything is ready to go when I get home. When do I have time to blog everyone asks me. You know, I’m not quite sure. Many of my food photos actually need to be taken in the evening. Winter is a huge challenge because it’s dark by the time we get home. No natural light to be found. Most of the time when I do take my pictures the food is sitting right in front of me on the table ready to be eaten. I think I’ve mentioned before – I actually DO eat the food I post on the blog. If I prepared it, I’m eating it. If it’s really good, I post it. So when I say these recipes are tried and true, they really are. 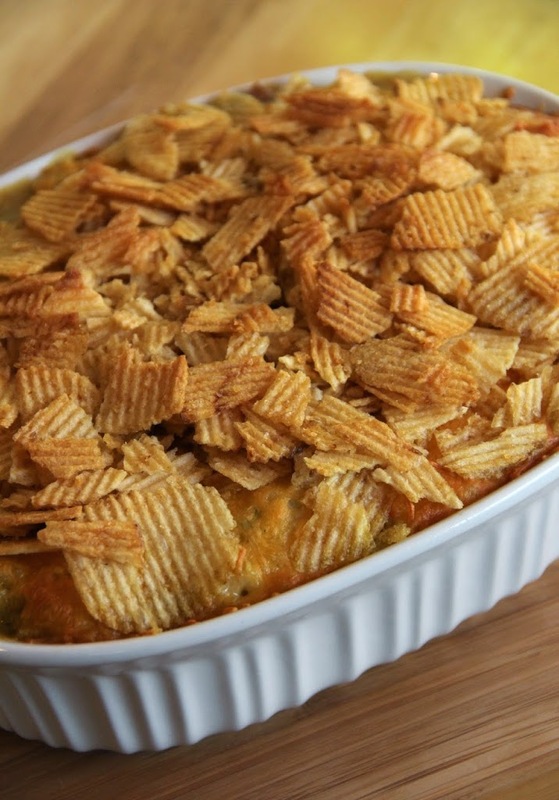 This Chicken & Potato Chip Casserole isn’t the healthiest dish in the world, but that may be why it tastes so darn good. It’s quick because it uses Rotisserie chicken. 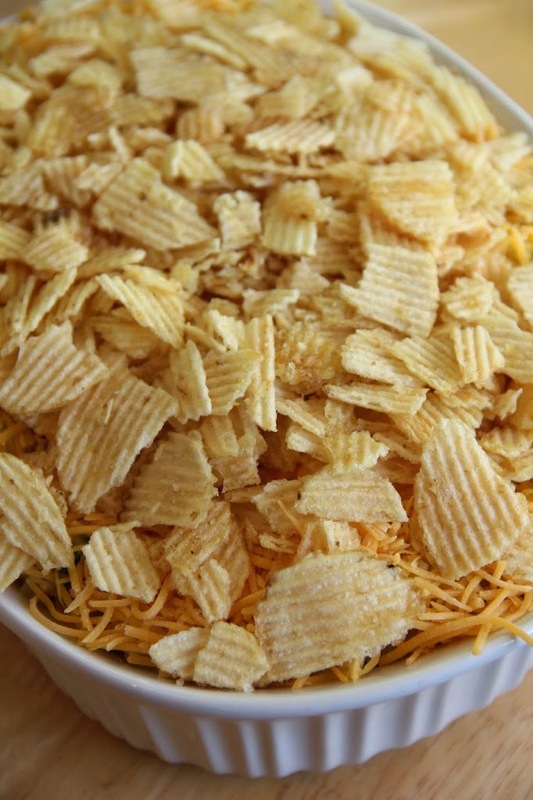 I think the best part about this casserole is mixing all of the ingredients together in a bowl. You got some chicken, throw it in. You got some broccoli, throw it in. Once it’s mixed all together, transfer it to a lightly greased baking dish. 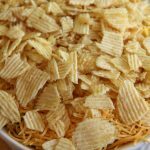 Then cover the mixture with shredded cheese and crushed potato chips! I ate the ones that fell off of the top, I’ll admit it. Did you notice this recipe doesn’t call for salt? You don’t need it. With the chips, rice, cheese and soups, there’s plenty. Trust me. Put the casserole into a 400 degree oven for about 30 minutes or until the chips start to brown and the casserole is heated through. It’s looking good, isn’t it? This is chicken & potato chip casserole is the ultimate comfort food. Definitely not a dish I prepare weekly or even monthly because of the calories, but when we do eat it, we thoroughly enjoy it. Of course we do. It’s comfort food! Now excuse me while I get to cleaning up, and baths, and teeth brushing, and books. 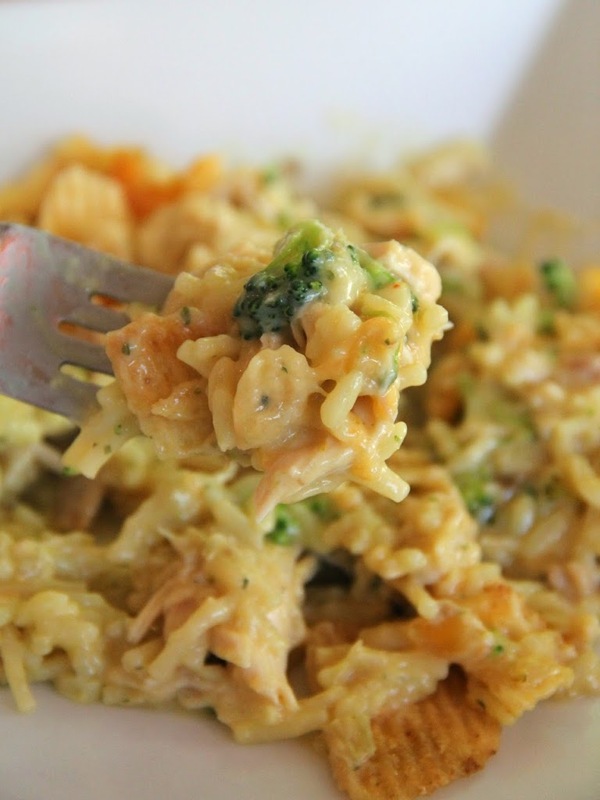 . .
Chicken, rice and broccoli covered in melted cheese and crisp potato chips! 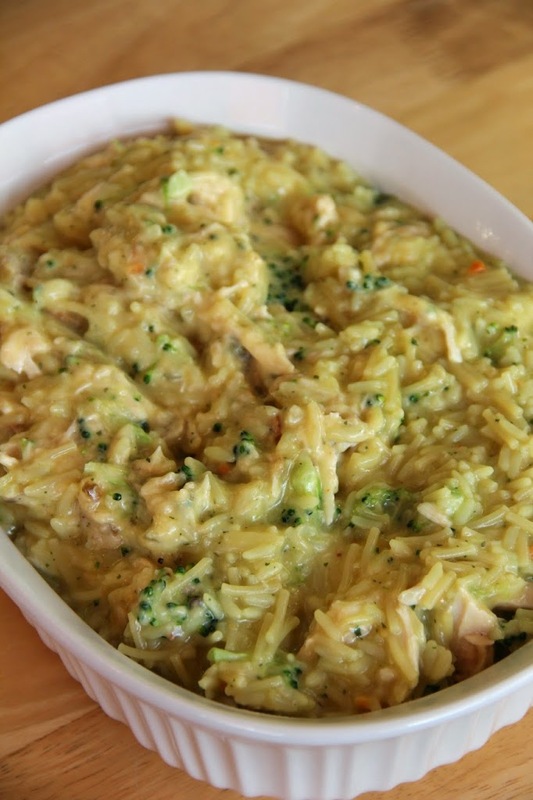 In a large bowl combine the chicken, prepared rice, soup, minced onion, broccoli, lemon juice, water and pepper. Spread the mixture into a lightly greased 9×13 inch baking pan. Bake for 25-30 minutes or until the potato chips are browned and the casserole is heated through. Pinning and Sharing at this week’s most viewed Link at Freedom Fridays!! Whoo Hoo!! Thanks for sharing! Whoo Hoo is right! Thanks so much, Evelyn! This looks great, it is on the menu for this week, and if we love it as much as you do it will go on my blog, with a link back to you! Sounds great, Raegan! I sure hope you enjoy it! Found this on Pinterest. I made it tonight and it was delicious. Thank you for a quick and easy recipe! I’m so glad you enjoyed it, Sheyanne! Found this recipe on Pinterest and made it tonight for dinner. Absolutely delicious!!! Thanks for sharing!! I’m so glad you liked it, Kesha! Did you use three cans of condensed soup? Cream of chicken cream of mushroom and cream of celery…or is there a cream of chicken. sunroom that I don’t know about? Hi Jess! Yes, there is a Cream of Chicken & Mushroom soup. I get the Campbell’s brand. Good luck! About how much did this make? I’m trying decide if I need to double the recipe for my hearty eating family of 6. Heather, we had enough leftovers for two days for our family of 4, but you could always just make a 13×9 inch pan and then halve the recipe and use an 8×8 inch pan if you think it may not be enough. Good luck! Can I use either 2 cans of the cream of chicken or celery to replace the mushroom. I’m not a fan of that one. Becky, yes I think either would be fine! I love potato chips! I’m really, sorta, actually addicted to them! I’m going to have to try your recipe! Stopping by from Saturday Dishes linky party and pinning to Pinterest. This was delish!!! Have you ever put the leftovers in the freezer?? Do you think it will freeze well? It would probably be just fine if you omitted the chips for freezing and added them in when you were ready to eat! Let me know if you try it! I have made this before & loved it. I got the stuff to make it again but forgot & got frozen broccoli florets instead of fresh. Do you think I’d need to alter the recipe or cook time at all for frozen, or cook them first? I’d steam them for a few minutes first if you’re using fresh. The oven temp may not be hot enough to really cook them through in time. Anyone use chicken breast instead of rotisserie? I forgot the rotisserie so had to boil breast. If so how did you season the chicken after shredding? Had to make this again. It’s so good everyone loves it. Easy to make and delicious. This casserole is a family-pleaser for sure! Thanks for the comment, Lori! I don’t like the broccoli and think it could be left out. I wonder if this same recipe could be made with Tuna? I think you could definitely sub tuna for the chicken! Hi Donna! You could just use two cans of the cream of chicken. It should be just fine!